This training is designed for data analysts, who have the data modeled and ready for them to visualize. 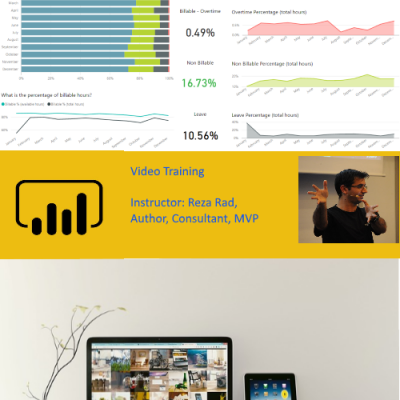 In this training, you will learn detailed visualization practices of Power BI. 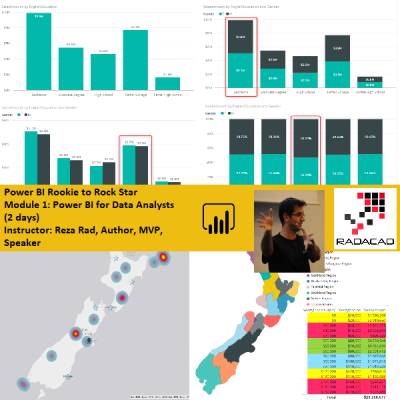 In this two days training, you will learn all components of Power BI needed for building Power BI reports and dashboards. You will learn about components such as Get Data (Power Query), Modelling and DAX, and Visualization. You will also learn about the Power BI service (website), and components that are needed to share your reports with others. The training continues with more focus on Visualization components such as different types of charts and visuals and scenario to use them. You will also learn about advanced visualization techniques such as designing mobile reports, changing the interactivity of visual, detailed learning of slicers and filters, creating parent-child reports, etc. At the end of this training, you will be able to do all visualization requirements for Power BI and will understand all other components of Power BI and how these are all working together. Power BI is the newest Microsoft Business Intelligence and Data Analysis tool. In this module, we will go through the basics of this product and introduce all components of Power BI (Power Query, Power Pivot, Power View, and Power Q&A). You will see some demos and introduction about Power BI desktop, Office 365 Power BI subscription, and Power BI website, and mobile apps. You will see some basic demos of how easy to use is Power BI in some scenarios. Introduction to Power BI Components: Power Query, Power Pivot, Power View, and Power Q&A. Getting Data is the first experience of working with Power BI. You can connect to many data sources on-premises or on the cloud. In this section, you will learn how the Get data experience in Power BI is and how you can transform the data in a way to get it ready for modeling. Data Modelling in Power BI is an in-memory-based technology. You will learn about the structure of modeling in Power BI, and you will learn the importance of relationships and their direction. You will also learn about calculations in Power BI and how to write them. DAX is Data Analytical eXpression language. DAX has a similar structure to excel functions, but it is different. In this module, you will learn DAX about DAX too. Data Visualization is the front end of any BI application; this is the user viewpoint of your system. It is critical to visualize measures, and dimensions effectively so the BI system could tell the story of the data. In this module, you will learn conceptual best practices of data visualizations which is valid through all data visualization tools. You will learn Power BI visualization skills. You will learn how to create effective charts, and dashboards using these tools as well as best practices for working with Power BI Desktop. Power BI components can be deployed into different environments such as Power BI website, Office 365 subscription, or even SharePoint on-premises. In this module, we will go through deployment options, Configurations, and requirements required for each environment. 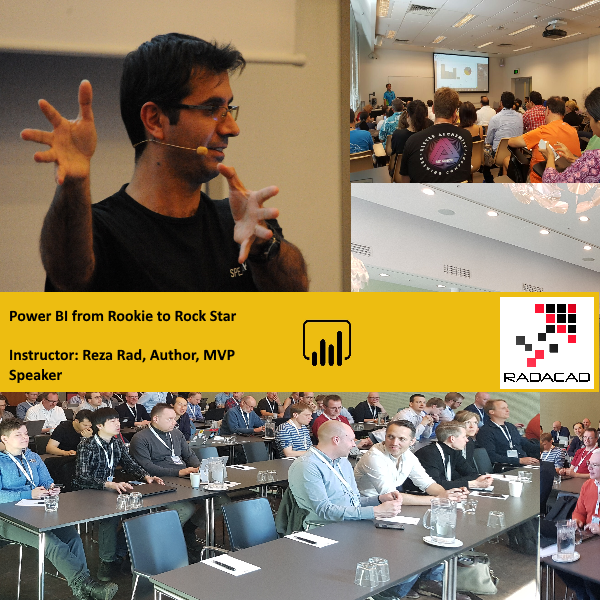 You will learn how to deploy your Power BI files into Power BI website. You will also learn how to build dashboards on the website, and how to work with Mobile Apps for Apple, Android and Windows Phone. Visualization is an important part of any BI system. In Power BI, Visualization plays a critical part. In this section, you will learn about why visualization is important, with few basics of visualizations such as comparing stacked vs. clustered chart. You will also learn in this section about data exploration techniques such as drill down/up, using pages, etc. The importance of slicing and dicing data in Power BI is critical. Power BI is not a visualization tool only, but it is also a data exploration tool. There are several ways you can filter the data. In this section, you will learn the difference between filters and slicers. You also learn about different scopes of filtering, as well as filtering modes. For slicers, you will learn different types of slicers and some advanced features such as syncing slicers through different pages. Know that you know about visualizations and slicing and dicing, it is a good time to talk about some advanced techniques which will take your visualizations to the next level in Power BI. You will learn about techniques such as changing the interaction of visuals, report page tooltips, Bookmarks and dynamic visualizations in this section. It is a good time to learn about all built-in visuals in Power BI now. It is important to know which visual should be used in what scenario. You will also learn in this section about the pros and cons of each visual. You will learn specific features of the visual that can help to solve real-world scenarios. All the examples will be hands-on. In Power BI, there are multiple ways of visualizing items on the map. In this section, you will learn about all the built-in ways of using map visuals in Power BI, the pros, and cons of each method and special considerations for some of the visuals. In addition to the built-in list of Power BI visuals, you can leverage some of the third party visuals created by other companies called Custom Visuals. Creating custom visuals is a developer topic, which we won’t discuss in this training, but you will learn about how to use custom visuals. You will learn about the most useful custom visuals in Power BI through many demos. This training is designed for data wrangler, data developer or data transformer, who have the raw data coming from one or more data sources and want to make it ready for further modeling and analytics. In this training, you will learn detailed data transformation practices of Power BI using Power Query. In this course, you will learn all things about Power Query, from zero to hero. You will learn Power Query from basic level with Getting data from different data sources. You will learn about different types of transformations available in Query Editor. Table transformations such as Pivot and Unpivot will be discussed, as well as specific column transformations such as date column transformations. You will also learn about M (Power Query Formula Language) in deep. Unique features such as error handling, generators, structured columns, custom functions and many other advanced level features of Power BI data transformations will be explored through hands-on labs and lecture. After this course, you will be able to implement any types of data transformation through Power Query in Excel or Power BI. You will be able to work through your raw data and make it ready for modeling and analytics. In this section, you will learn about Power Query basics which starts with Getting data. You will learn that Power Query is the data transformation tool in Power BI. You will learn different parts of the Query Editor through an example of using Power Query to transform a dataset. Before going any further in learning Power Query, you need to understand about data structures and data types. There are three main data structures in Power Query; table, record, and list. You will learn about these types through an example of getting data from a JSON structure. You will also learn about data types and their differences. One of the most common data transformations is combining datasets. Depends on the types of datasets and the way that they are related to each other, you may want to merge or append them. In this section, you will learn why you need to combine data at first, and then you will learn about scenarios that you combine data in Power Query. To get the best experience with Power Query Editor, you need to consider organizing your queries and steps in the right way. In this section, you will learn about actions you can do on steps, such as moving them up or down, splitting steps in a query, etc. You will also learn about organizing your queries in groups (folders). Be Careful of Actions; Undo! Filtering rows in Power Query is an important transformation especially when the dataset is big, or when the data needs to be cleaned. There are different ways of doing filtering in Power Query. You will learn about ways to remove some rows from the top or bottom of the table, and ways that you can filter a data table based on criteria. You will learn about basic filtering and the difference of that with the advanced filtering, and potential challenges that you may have through this process. A data table in Power Query can get big if you don’t care about columns. In this section, you will learn actions that you can do on columns, and what are best practices to make sure you have the best performance in your Power BI model considering columns in your tables. You will also learn about some generic column operations and transformations. Some of the most important table transformations will be explained in this section. You will learn about a way to change the granularity of a table; Grouping. You will also learn scenarios that grouping data can be more than a simple transformation. You will learn about transformations such as Transpose, Pivot and Unpivot, and the difference of all these items with scenarios of using it on real-world datasets. When you work with text values, there are many transformations you can apply. Transformations such as a split column, removing part of a text, or adding a prefix or postfix to it, concatenating some columns together, etc. You will learn in this section how to do numeric transformations. We will talk about standard transformations such as divide and integer-divide. You will also learn about transformations such as rounding, statistics transformations, and even some scientific transformations and use cases for those items. Standard transformations; Divide, Integer-divide, Multiply, Add etc. Scientific transformations; logarithm, power square, etc. Information functions; Is Even, Is Odd, and Sign. There are many transformations applicable to date and time columns. You may want to fetch year part of a date or get the fiscal calculation of a date. You may want to calculate age based on the birthday or calculate the difference between two dates. You will learn all these items in this section, you will also learn about time zone consideration when working with current date and time in Power BI, and how you can resolve it in Power Query. When you combine tables, you get a structured column as a result, which can be a table, list, or record in every value. There are several transformations you can apply on structured columns, which you will learn in this section. You will also learn what may be the potential issue with some of these transformations. What is a Structured Column? There are two types of transformations in Power Query; Transforming an existing column, or adding a column based on a transformation. In this section, you will learn about these two types, their differences, and few other transformations that we have available in the add column tab of the Power Query Editor through some examples. Power Query is a powerful tool for data transformation. This power can be amplified even more if you can make your queries dynamic. Instead of repeating several steps for similar data sources, you can create a function from those steps, and run that function for all other sources. Functions get parameters as the input. Functions and parameters can make everything in Power Query dynamic. If you want to learn Power Query advanced deep dive, this is the section to go through. The heart of Power Query is a scripting language named Power Query Formula Language or M. If you want to be a good data wrangler or data developer with Power Query, you must learn M scripting. The good news is that M scripting is not a hard language to learn. This section goes through the basics of the language, data types, literals, and everything is needed for understanding an M script’s structure. As you are dealing with data in Power Query, it is important to learn how to work with table, list, and record from the code. In this section, you will learn about these three structures in code, and how to navigate between different parts of each structure. Now that you know more about M scripting, it is time to see how powerful this part of Power Query can be compared to the graphical interface of query editor. In this section, you will learn features that you have access to apply using M scripting. You will learn ways to get a list of all functions, doing error handling in an advanced way. Applying some changes in functions and parameters which is only possible through the code. You will also learn an end-to-end example using everything you learn about M at the end. Some transformations or operations needs careful attention in Power Query. In this section, you will learn about performance tips and trick for Power Query to make sure you have always a well performance tuned data transformation logic. Each sample will be discussed through the live demo in this section. In any data related solution, you should expect bad data rows to appear. If you haven’t thought about the appearance of bad data rows and you just did the transformations considering everything will be nice and tidy, then you may face many errors in Power Query. This section is all about how to handle errors, deal with bad data rows, create troubleshooting reports, etc. At the end of the training, we go through some end-to-end solutions using Power Query. These solutions leverage everything you learned through the training about this tool and language; you will see how all those parts come to help together to build the solution. We will go through building a date dimension which has all calendar columns, fiscal columns, and public holidays fetched live, and we will talk about combining files from a folder. This training is designed for data modeler, who have the data prepared to be modeled for analysis. Usually, people who attend this training needs to attend module 2 beforehand to learn about the step before the modeling. 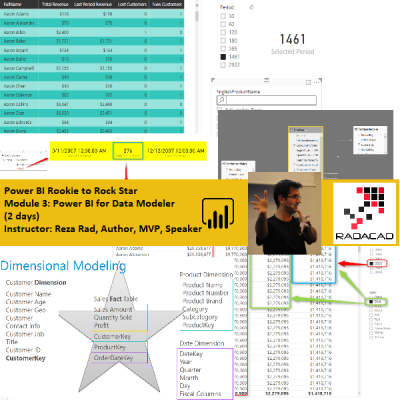 In this training, you will learn detailed modeling practices of Power BI, and DAX unleashed. In this two days training, you will learn DAX from zero to hero. You will learn how to design the best model in Power BI with relationships, considering formatting and data types. You will learn about DAX which is the data modeling expression language in Power BI (and SSAS Tabular, and Power Pivot). You will learn from Simple DAX calculations to complex expressions and calculations for solving real-world challenges of a BI solution. The training continues with more focus on DAX; we will talk about the evaluation context in DAX, which defines the mindset and the way of thinking when you are writing DAX expressions. You will learn about DAX function categories such as Aggregation functions, Iterators, Filter functions, parent-child functions, time intelligence functions, functions dealing with relationships, etc. You will learn all scenarios through hands-on examples of real-world data. 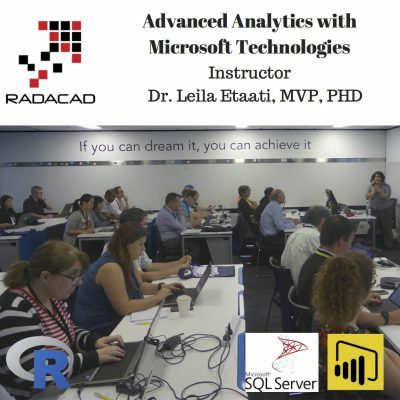 At the end of this training, you will be able to design the proper data model in Power BI, understand all relationship requirements and implement the right relationship, write complex DAX expressions for your analytics need, and put them all together to build the best model for your data analysis solution using Power BI. Power BI Modelling engine is based on the same engine used in Excel Power Pivot, and SQL Server Analysis Services Tabular. Power BI uses the in-memory engine, named xVelocity. The in-memory engine of Power BI makes the analysis super-fast. Everything will respond very fast in this model. In this section, you will learn about the basics of the modeling engine and some of the differences of that with SSAS and Power Pivot. DAX is an abbreviated name for Data Analysis eXpression language. This is the expression language in Power BI for analytics. DAX is a dynamic expression language which will consider the interaction of the user at the time of visualization. Using DAX, you can do calculations such as year to date, year over year comparison, etc. Most of the data modeling training is about DAX. In this section, you will learn the basics of DAX. DAX or M? When to use Which? There are three types of calculations in Power BI. Calculated Column, Measure, and Calculated Table. You can write DAX expression in all these three types of objects. This section will teach you what the main difference between the calculated column, measure, and the calculated table is, and what are scenarios of using them. The first set of important functions in DAX are aggregation functions. There is a set of normal aggregation functions such as SUM, MIN, MAX, and there is another set called iterators. The way of working with iterators is different. Iterators get an input table and an expression. Example of iterator function is SUMX. In this section, you will learn the difference between SUM and SUMX and scenarios of using those two. Filter functions are probably the most important functions in DAX. You can refer to a column in DAX (like Excel), but you cannot refer to rows. If you want to refer to rows in an expression, you must filter it, and that is why Filter functions are important. There are several filter functions, and the behavior of all of them are unique. In this section, we will talk about some of these functions through real-world examples. Understanding Evaluation contexts are one of the most critical learnings in DAX. The evaluation context refers to the way that filters impact the calculation’s result in DAX. There are two types of contexts; Row context, and filter context. In this section, you will learn about the difference of all these, and you will learn scenarios that you need to be careful when the context changes. Some of the functions in DAX are going through directions of relationship and apply some filtering based on that, like RELATED() for example. Some other functions change the behavior of relationship such as UseRelationship() function. In this section, you will learn about relationship functions in DAX and scenarios of using them. Calculations based on time and date are critical for many businesses such as finance. You can use DAX to do calculations such as year to date, fiscal year to date, year over year comparison, and rolling 12 months average. In this section, you will learn some basic time intelligence functions such as TotalYTD to a calculated year to date. You will also learn about scenarios when you do not have the built-in function for your use case and will learn how to write the combination of function usages in DAX to achieve the solution. DAX calculation is dynamic based on the user interaction in a Power BI report page. However, you can take a step further, and make the expression of DAX even more dynamic. The user can change a value which is defined statically in your DAX expression using a parameter. Parameters will make your DAX expressions even more dynamic. In this section, you will learn about parameters, and their usages, and the scenario of using a parameter table to select from multiple measures dynamically. DAX can navigate through a hierarchy with an unknown number of levels. Example of such a hierarchy is a chart of accounts or organizational hierarchy. In this section, you will learn about parent-child functions which can be used for organization hierarchy. You will learn different scenarios of using these functions in real-world examples. Performance considerations when doing the modeling in Power BI is the last but not least important part of this course. You will learn about tips and tricks that keep your model performing well even with a huge number of data rows. In this section, you will also learn about other tips that make the maintenance of your model easier, such as using a tool like Power BI Helper.